In order to use Data Pump, the database administrator must create a directory object and grant privileges to the user on that directory object. If a directory object is not specified, a default directory object called data_pump_dir is provided. The default data_pump_dir is available only to privileged users unless access is granted by the DBA. REMAP_TABLESPACE REMAP_TABLESPACE=source_tablespace:target_tablespace Remaps all objects selected for import with persistent data in the source tablespace to be created in the target tablespace. REMAP_SCHEMA REMAP_SCHEMA='source_schema':'target_schema' Loads all objects from the source schema into a target schema. Note how the FROMUSER/TOUSER syntax of the old imp is replaced by the REMAP_SCHEMA option. 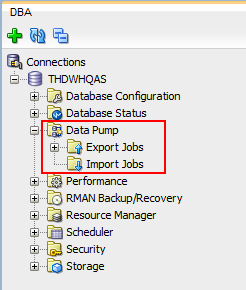 impdp can export the DDL of a dmp backup with the sqlfile option.